We know how important your wedding is. We offer you the most stunning venue in Wilmington, NC, and the Southeast to take the first step on your wonderful new adventure. Your wedding is, perhaps, the single most important event of your life to date, a celebration of your love, your commitment, and the wonderful journey you're about to begin. You deserve a wedding site that lives up to your expectations, that delivers the promise of an elegantly dramatic setting that you, your family, and your guests will remember forever. the full use of the church, the manse, and the courtyard with a 15-hour event timeframe. It's your wedding day; the last thing we want is for you to feel hurried. Slow down. Enjoy and remember every moment. The Brooklyn Arts Center at St. Andrews, located in an 1888 historic landmark church that has been thoughtfully and beautifully refurbished as Wilmington, NC's, most stunning event venue; can comfortably accommodate up to 250 guests. The 60-foot cathedral ceilings are draped with white fabric and back-lit by a state-of-the-art, LED lighting system that can turn the entire ceiling whatever color your heart desires. The arched windows are two stories tall, the walls are original brick and plaster, and 130-year-old stained glass is displayed like fine art. The 35-foot, North Carolina-pine altar adds one-of-a-kind beauty, charm, and unmatched drama to the church. A large stage, dance floor, and fabulous balcony complement the altar and provide additional charm and party space. Right next door to the church is the church manse, the historic, century-old home of the St. Andrews reverend. The first floor of the manse has been designed, decorated, and repurposed as a peaceful retreat, salon, and dressing area for the bride, her wedding party, and her family. Behind the manse is our courtyard, a large, fenced, private garden that can host 250 for a ceremony or cocktail hour. We have a 100-car parking lot located within one block of the venue, and there is plenty of free street parking in our neighborhood on North 4th and Campbell Streets, all within one walking block of our campus. We work closely with the region's finest professional wedding planners and coordinators, caterers, florists, photographers and videographers, musicians, suppliers, and other preferred vendors. 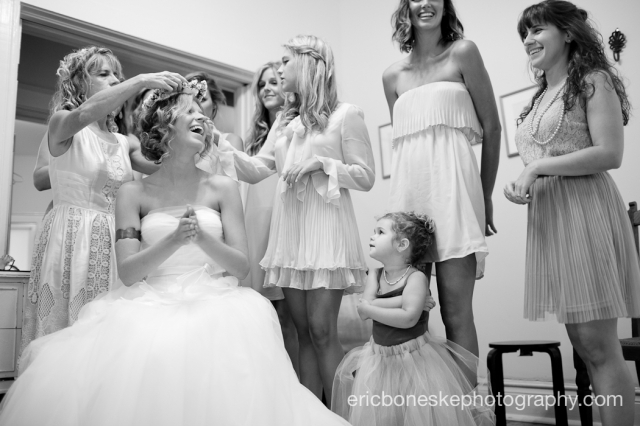 You choose who is right for your wedding, and we will help make sure their work is seamless and stylistically perfect. As you might imagine, the Brooklyn Arts Center is a keenly sought after wedding venue. We encourage you to contact us with questions and prospective dates well in advance. We look forward to hearing from you.